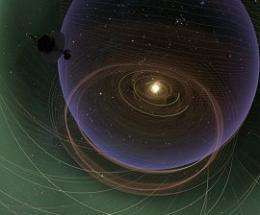 Voyager flies through the outer bounds of the heliosphere en route to interstellar space. A strong magnetic field reported by Opher et al in the Dec. 24, 2009, issue of Nature is delineated in yellow. Image copyright 2009, The American Museum of Natural History. The anatomy of the heliosphere. 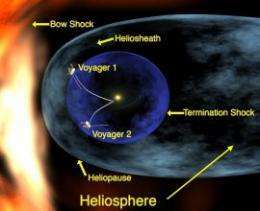 Since this illustration was made, Voyager 2 has joined Voyager 1 inside the heliosheath, a thick outer layer where the solar wind is slowed by the pressure of interstellar gas. Credit: NASA/Walt Feimer. To read the original research, look in the Dec. 24, 2009, issue of Nature for Opher et al's article, "A strong, highly-tilted interstellar magnetic field near the Solar System. the comeback of plasma cosmology? I wouldn't say Alven was completely right in fact he made some incorrect observations as well, but he wasn't completely wrong either. Electromagnetic forces are out there with gravity, they aren't mutually excluswive so we shouldn't be limited to a standard model or a plasma model, theres is hybridisation on many levels and scales. at least the scientific advances in instruments and telescope and computational power regarding magnetohydrodynamic flows allows us to observe and calculate that electromagnetic forces play a bigger part in the evolution of the universe than we were able to observe / account for than in the past. maybe the missing mass and dark matter might be explained by plasma cosmology. What are the odds this 6k C cloud is having an affect of warming our environment? It looks like we entered that cloud 'recently'. There is no "interstellar cloud that . . . should not exist." What is, . . . is! What is cannot be changed! we entered this local fluff ~150k years ago. So don't think we're entering new one. So this would this offer some protection against a local star going nova? This IS protection against 'local stars' having gone nova in the distance (for us...) past ;P, on an interstellar scale it's still 'current'. I had a giggle at the climate change comment, 170000 years we've been in this cloud. I am new to this community. In reading all of the comments about this article I must say that I find it refreshing that there are so many intelligent people reading PhysOrg! Thanks for all of your comments! There are a striking number of situations which, together, have allowed life to evolve on earth. The sun protecting us from the fluff, and the earth's magnetic field protecting us from the sun, and Jupiter protecting us from the asteroid belt, and the fluff protecting us from the supernovae. The ingredients for life may well be strewn about everywhere, and life itself may get started with the least amount of opportunity, but we are learning what it takes to evolve uninterrupted for 4.7 billion years, and it may take a very special situation. The fact that we have been listening, attentively, for any sign of life, and we have found none whatever has physicists taking pause. To destroy this earth by polluting our water, air, and soil, in just over 100 years is sacrilege. Could a manned spacecraft safely fly through these interstellar clouds? Can someone offer a good comparison for the strength of the interstellar cosmic radiation? And at what spacecraft speed might the density of the local interstellar material begin to impede travel or become an issue? I'd appreciate any response or direction to other sources for the answers. Thanks. Who hoo! Magnetic intestellar travel here we come! Sailing the mag clouds like ocean currents. I wonder if we have magnetic trade winds and doldrums. This is awsome. It could also explain some of the Tesla ether he was tapping into. Its the turn of the century with discovery all over again! Candy for the brain. You are aware that earth's climate has been in a constant state of nothing but change for the past 4 billion years of it's existence, right? That the one certainty regarding global climate is that it will change? I mean, you don't really believe that change in climate is anything new or even something to consider as a threat, do you? Much like omatumr said, it simply is. Nah, you're certainly able to see that our inability to adapt to a changing climate is the only thing to be afraid of. And correspondingly that all proposed "carbon shuffling" legislation actually promotes continued reliance on fossils and obscures the importance of adaptability, and supporting that goal directly. Certainly you've put more thought into the matter than what the powers that be have fed you. Yes? Lot's of good stuff to end the year with!! How about those two little spacecraft? Still truckin' and communicating! Still more good stuff to learn, while we sweat under even more G/Warming. Get used to it, folks. It's the nature of the Universe. Happy New Year to all. For gods sake, you pro-/anti-global warming posters, just because the gas cloud is at 6000K doesn't mean a thing! Gas temperature is a measure of the average speed of the molecules. Sure, those hydrogen and helium molecules are moving fast, but there are very few of them per cubic meter. That cloud of gas is probably a better vacuum than we can make on Earth. If a few high-speed molecules hit you, you won't get hot. Heck, you won't feel a thing. To get heat transfer, you need high energy density, not just high temperature. It's amazing the two Voyager spacecraft are still operational after all these years! It's even more amazing we can find their minute signal from this far away. If they can stay working long enough to get to interstellar space - what an accomplishment. I bet the engineers who built them are patting themselves on the back. In his Cosmos series, Carl Sagan said that all the energy from all the radiowaves recieved on earth from the heavens in modern radio telescopes is less than the energy of a single snowflake gently settling to earth. Great stuff! Magnetised hydrogen... fascinating. How was it magnetised? Is this "local fluff" behaving as if it's a BEC, or something? What are the optical effects? Still giggling eh? What science "knows" about the universe and fifty cents couldn't buy a cup of coffee at dawn donuts. Really, such arrogance. Try to remember that everything that could be discovered about physics had been accomplished by 1901, so said the "great minds" of science at that time.Despite your "advanced" education, you have sadly missed the entire point of science; The questions are more important than the answers. The questions basically stay the same, it's the answers that change. So please, don't berate the curiosity of those who clearly show more wisdom than you; who already know everything. Good luck with your career, as thoughtfulness seems to missing from your resume. You must be a college professor. Good luck with your career, as thoughtfulness seems to missing from your resume. You must be a college professor. Please pardon my asking, but to whom are you referring? I suppose that was a bit over the top, and I apologize if it is taken personally, I guess my point is that science sometimes talks and looks down on the "little people" when in fact throughout the history of science they are continuously wrong, wrong, wrong, until...they get it right. Science has nothing to brag about when it comes to understanding the facts. "I had a giggle at the climate change comment, 170000 years we've been in this cloud." I don't like to see comments like this cause it reminds of sciences dubious past. Ice ages, plate tectonics, Copernicus and Galileo all ridiculed or worse, by people well versed in the science of the day. Let us all resolve to be a little more humble(myself especially! )when the issue of what we know vs. what we understand comes up. All hail the glorious data, highest of praises to the keepers of the math. First, what is the density of this cloud? Temperature (6K C) and heat ARE NOT the same thing. Second, do we know, at this point, whether this cloud is the source of the Cosmic Background Radiation? As I agree, "The questions are more important than the answers"; Of the reference stars in the second picture, is there any record of any increase and/or decrease of output? If one to propose that stars assume their energy from their environment, any observable changes in that environment should manifest in output of the star. I would also like to point out to anyone wondering if this cloud is effecting the global climate, that even if it did have a very high specific heat, it would be difficult to conduct this energy through the near vaccuum of space. As the article mentions, the magnetic field of the sun keeps the cloud out out of the solar system.